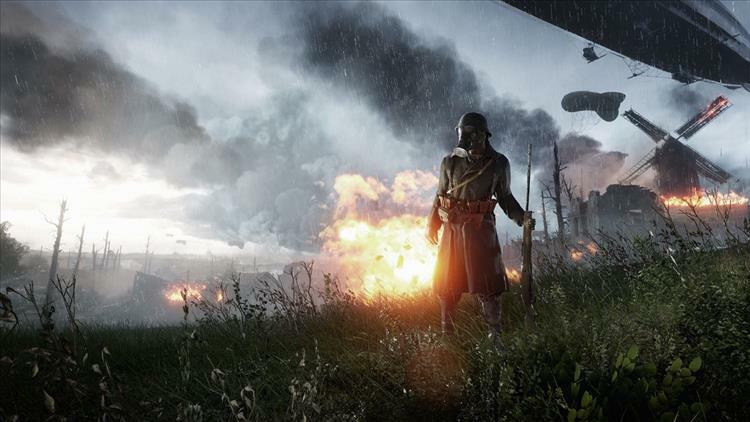 If you’ve read our weekly “What are you playing?” posts, you’ll notice that I’ve been putting a ton of hours into Battlefield 1. And trust me, I have. I’ve had the game for about a month, and am already at the halfway point to the top rank, for someone who hasn’t habitually played multiplayer games in what feels like years, this is a huge accomplishment. But aside from the Kill/Death Ratios, the customization of my soldier classes, and yelling while my system lags because it’s at the farthest point from the wifi modem, I find myself thinking just how unique this game is, compared to a lot of other war shooters that I’ve played over the years. Now, this does not mean that Battlefield 1 is some genius piece of risqué art. It’s a piece that is targeted at the masses, yet, it really does something different. I’d like to take a bit of time today to talk about the game’s two main components: Single-Player and Multiplayer, and how it treats war. A bit of clarification first, though: I am versed neither in real war nor in any professional academic study besides what books I’ve read on the subject. If I may recommend some: War by Sebastian Junger (nonfiction), Redeployment by Phil Klay (fiction), and These Heroic, Happy Dead by Luke Mogelson (fiction). It’s great writing that takes a human view at the cost that war takes on people. But now onto the campaign. Rather than a plotted sequence of events, it’s a collection of disconnected missions that tell a sort of short story for each of the characters involved. There are three missions that hone in on the strengths and weaknesses of the game’s treatment of World War I, which focalize on emotional beats. The first, and best, mission, is “Storm of Steel”. Its gameplay is unique in that players control characters (members of the Harlem Hellfighters holding off German troops) who inevitably die. Names, birthplaces, and the years lived come up on screen, and then the player switches to another character. The screaming, the slow motion as the character is on their last legs, and the intensely gray and brown color palette all weave together excellently to create a consistent tone of crushing hopelessness that is this seemingly unending cycle of violence. “The Runner” follows this up, although with a different emotional beat. Players control of an Australian message runner named Bishop who participates in the invasion of Gallipoli. Under his wing is a young man named Foster, who lied about his age so he could join up. The gameplay is not so hopeless as the first mission, but the humanity explored in the two characters is refreshing. So it’s only appropriate that Bishop, initially cynical, changes his tune for the morale of his young protégé, only to die in a friendly artillery strike. My memory had told me that Foster was the one who died, not Bishop. I was ready to write about how the Battlefield 1 writers implicitly made a moral statement on how young men die in old men’s wars, but the truth of how the mission really plays out is also powerful. Yes, it does paint Bishop as a sort of tragic hero, but in this case, it’s still poignant. These last two missions don’t elicit dissection, so much as complaints. “Avanti Savoia” and “Nothing is Written” take place on the Italian and Arabian peninsulas, respectively. Both have high-octane action, and both peter out in an attempt to gain some sort of empathy for the story that was told. The mistake that “Avanti Savoia” makes is actually in its opening moments, when the protagonist’s granddaughter happens upon him while he is looking at old photos. She spots one of his brother, who actually dies in the mission, and the protagonist proceeds to tell his granddaughter a violent war story, which the player acts out. At the end, we get a text screen telling how the ones who fought, survived and died in the war were deemed “The Lost Generation”. It’s really quite pathetic. “Nothing is Written” follows the same formula. War story with epic explosions, followed by a terrible box text that talks tries to be contemporarily relevant. In this case, it states that the British and French would not permit the Arabs autonomy in the wake of the war, because the European countries wanted control of their oil fields, and how the fight for that resource continues to this day. While that point does strike a chord, it is severely weakened by the fact that us players are told that, rather than being shown it. I know it probably would have been boring to watch a cutscene of economic power struggles, but maybe something like Lawrence of Arabia connivingly scheming to betray the Bedouin might have given the ending a bit more impact, even if it was negative. Admittedly, dissecting only parts of the campaign turned out to be more complex than I thought it would be. But at least that leads to the part that most players would consider “fun”, and the one that packs the most ideas behind it: the multiplayer portion of the game. I imagine that most of the time, players aren’t reflecting on the carnage caused by the grenades, bombs, and gunfire, so much as basking in it. The destruction of this game is more pronounced than any of the previous entries. Sure, there may not be any collapsing skyscrapers, but the changes in landscape caused by players’ actions brings something unique to matches every time I play the game. The relentless onslaught of soldier-players pushing towards objectives in modes like Operations, Conquest, and Frontlines, necessitates either a slaughter or constant back-and-forth over which team controls a small hill or a little town. It comes to a sort of thesis, that is present all over the game: that war is a constant battle over land that ultimately proves useless. I say useless because, at the end of the day, players are out to gain points, to level up, to unlock this or that weapon. We’re not fighting over anything real, but it feels like it, at times. Whenever the enemy team—let’s say the German team on “They Shall Not Pass” map Verdun Heights—takes the hill fort or the church in the middle phase of the Operation, I get angry. Part of me gets angry at my team, especially if we have a full roster. We have the numbers, so why shouldn’t we have the tactics? But another part of me is consumed with an energy that makes me want to push the Germans out with all my might. No, I don’t start singing patriotic French songs, it’s not like that. It’s something beneath the numbers of enemies left, or the clock, or the kill count. I find myself running the same routes to find myself in the exact same poison-gas infested, scorched hallway filled to the brim with crossfire of bullets and grenades. It’s complete chaos. These guys are shooting at me, so therefore they are the enemy. It’s a mentality that is drilled into soldiers. Through civilian eyes, yes, it seems appalling. But after reading their stories you begin to understand that it is basic human instinct—to survive. And that’s what makes Battlefield 1’s multiplayer so good. I’m not praising it for rendering the ultimate, most realistic war experience in video games. A lot more brutality would need to be employed in the gameplay. Instead of simply decreasing health, perhaps poison gas could bubble the skin, or weapons could jam, or maybe some trench foot could be a thing. But I know that if that were the case, the servers would be put on quite the strain. So I’m okay with it. What makes the game so great is that it makes me feel the brutality and relentless pointlessness of war. I’m surprised that a multiplayer mode could actually make me feel something like that. I think it’ll be a while before another one does.